I've been trying to read to back on other's posts and questions, as well as your answers to them and I have also checked out the other smaller thread that has 2 charts. I'd kindly appreciate your advice and help as well as your kindness and understanding cause I'm really panicking right now and I've been having these panic attacks so frequently in the past few days and I really don't know who to turn to or what to do, so please bare with me. I have a little bit similar story to Zash99. I'll try to make it as short as possible to save you the headache. I'm a physician and my wife is an English teacher and we have come to Malaysia in Oct, 2015 with our son and we have been granted 90 months stay through Visa on Arrival. Then For the next few months, I've gone outside Malaysia and came back twice to renew the visa. Until I met someone who promised to provide me with a professional visa (and I'm sure you know how this story goes), and of course now I know how naive and stupid I have been. This person told me that he would need to first get me a special pass before he can start on processing my professional visa and later returned with stamped passports for me, my wife and 1-year-old son back then. He kept on playing with me for an entire year before he returned my passport back and started telling me that the stamps were fake. My daughter was born here in Malaysia in August 2018. Currently, my wife is seeking a divorce and wants to go back home and I want to do the same and face my fate over there and all I'm hoping for now that the wife and the kids at least don't get hurt. She acted on herself and got a police report for lost passports and went to the embassy and got 3 travel documents for her and the kids and I started researching what could be the fines when I came across all the horror stories of people being imprisoned and whipped and so on. 1. Based on my story what would be your advice? 2. Should I do the same and do a police report for a lost passport and get a travel document from the embassy as well? 3. I've asked someone I know who said he has a contact who used to work for IMI and he told me don't try to go to surrender cause they will detain everyone including the kids and I don't know if he is being true or he is just planning for a scam as well. I know you have told others that if they surrender they won't get detained but I just wanted to confirm based on my story as well as any recent updates. a) I think I should fall under the 6+ months category right? b) How much in total I should prepare, meaning I'd pay fines for the 4 of us or adults only or for me, my wife and son who originally came here together? c) Also, when does the act of "Not less then 10,000 RM and/or imprisonment apply? d) Also you have said 'BUT... If your reason is not acceptable, then you can be penalised under section 15(1)(c), Immigration Act 1959/63 (Revised 2002): "
How would I know if my reasons are acceptable? e) are there any guarantees or it's only a case to case situation and everyone has to test his luck? I know everyone says that but we really were very ignorant about everything and I feel I dragged my family into all of this and I never intended any harm and I hated that I got mixed up with all of this. I loved the country and the people so much and I never wanted to violate their rules. I'd appreciate your advice and I'd be so grateful for you having the time to read my question and direct me towards the right directions all I want now is to know how to act and the amount of money I need to prepare in order to make my family safe again. Once again please forgive me for my long post and if I have asked or repeated previously answered questions. I'm really sorry I just can't think straight at all right now. First calm down. Yours is not a serious matter. I have elephant ears, so you may have to bear with me for any more lengthy replies. Can I request you to do a re-post to this thread? Please log in as the user joschmidt and add in the country you, your wife and son is from plus all the ages. Date of the entry stamp into Malaysia on all the old passports. If situation permit, it could cost you less than 7K (total). Scammers would quote you 20k and you will lose everything...!! Please use that thread. You are the second "Family case" I have encounter in this forum. You came in as a family, you go back as a family is the safest journey. MY IMI can issue exit special pass to go out, but Airport Authorities can prevent your wife from travelling with the child born inside Malaysia. For your case, there are two laws involved now. Travel and Immigration Laws by two different Agencies. Yours is no longer ordinary overstay. And no issues if procedures is followed properly. I meant will this ban be from entering all countries or only malaysia? This BAN is issued by Malaysian Immigration as such will only be effected if coming into Malaysia. There is actually a few types of BAN. Some cases, there is be a RAI stamp. This stamp represent that the passport holder has be been JAILED before. Immigration policies are and will be changing drastically these 2 years throughout the world. For some countries that need pre-apply VISA, any jail offenses in any country, the visa application can will be rejected and that includes reports of "Lost of Passport". That is why I have always tell overstayers to use original passports to surrender to immigration to avoid any Jail Term. I am Not annoyed with your repeating Qs. I can understand your feelings towards the predicament of your brother. But the issue is that he has already been caught in a web of deceit by scammers and as such will be confused with what is the actual laws and policies. In fact there were at least 2 other cases of 20 years old teenagers who had overstayed their student visa and have been threaten by scammers. I have given them the correct procedures to get back, but they were so scared that their parents came down to Malaysia to accompanied them to surrender to Immigration. Well their parents can afford, what could happened if they do not have the funds to come here. They have returned safely and have updated me by emails. Please surrender to MY IMI if you have overstayed.. I am repeating like a Malaysian Parrot.. THERE IS NO JAIL TERM FOR VOLUNTARY SURRENDER TO IMMIGRATION. can you help me ,my husband is there and he has been stayed more than two years he has cheated by his friend at that time he has no money, but now he can pay for his overstay, but because they are arresting those who surrender . What will i do ? Was the RM21K paid to the College? So, in total, I overstayed in KL for 7 months. Please give me a solution and how much I need to pay because I want to continue my study in KL. I don't want to be blacklisted by Malaysia. Under what type of pass (Tourist Pass?) you have entered Malaysia? Do you have proof that people have been jailed for any Voluntary Surrender? Or is it from hesays, shesays. theysays? Everybodysays? This is what faked agents do, spread fake news to discourage their countrymen from leaving Malaysia. Then those fake agents will control all those who has overstayed. One would be a slave to them forever. What can you do? You are in India right? What he can do is to Voluntary Surrender to MY Immigration. 1. Is the original passport that he came into Malaysia still with him? 2. Is there an airport stamp, one immigration "ENTRY" stamp there when he first come in? It is also 100% true that some overstayers were arrested when they go to surrender. This situation does occur when faked stamp were found in the pages of their passports. Only the bearer of the passport knows what he/she did to the passport before. I know you are anxious of him being Jail . Let me share with you what had happened to the last 48 hours. I was very busy fighting one scammer in another website. One FB user posted her cousin's passport pages, out for clarifications. there were 4 stamps inside the passport. Two stamps were were from Malaysia, two stamps were from Singapore. I commented that the passports stamps were fakes if the bearer have not been to Singapore via Malaysia. That "comment" in Facebook triggered off a Lawsuit threat from that scammer (who had a Malaysian Dato husband) against me. Long story cut short with at least 30 FB users joining the whole altercations, many of whom postings evidence of cheating by that scammer. I had to ask the Administrators to delete the post and we wait for the Lawsuit because people have posted too many actual details of the scammer in Public. Her Foreign Passport, Local ids, etc etc. And I received at least another 200 private messages to my FB on the wrong doings of this fake agent. What a day, I don't even have time for my regular proper meals the whole day with msgs coming in and to reply for the concerns to help me fight the Lawsuit (if any). I had even someone suggesting a trust fund to help me fight this fake agent in Court. So I just sit back and wait for any Lawsuit from the Dato Husband. The passport holder have never exited from Malaysia before. Have already overstayed and worked in Malaysia for more than 2 years. 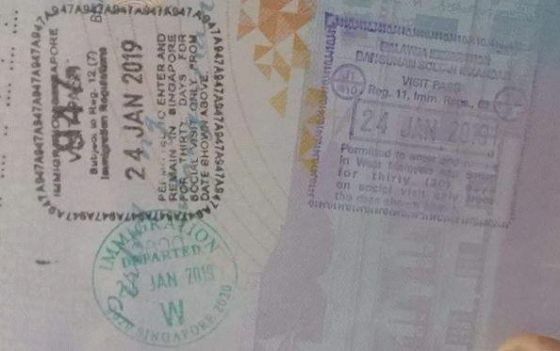 Immigration Malaysia have called it a "Flying Passport". It no longer works with the new computer Systems operating since end of 2017. 3. Many many new friends. Hello, here is Nikki again, I went to Nigerian embassy, they worked on my passport to remove the fake stamp and they got me an exit letter. Then someone from the embassy accompanied me to the Immigration Office. There they checked my old student visa and passport and asked me why I was overstaying. Finally, I paid the compound fine and went home. Now I am waiting already for a week that I get called to IMI to get my exit visa. My friend (Nigerian girl of the same age) who was overstaying too went to Embassy and later she went to IMI too. They send her home after asking her questions about overstay. Today they called her to come to IMI again, she thought for paying the compound fine but suddenly she was arrested. They told her she will be brought to court because of overstaying. Now I am really scared. What can I do, also is there anything I can do for my friend? She had a much longer overstay than me (She had 2years overstay and I have 1year plus) still I am very very scared. Phew.. I am glad you have follow my instructions on how to surrender to MY IMI properly. Still I am not clear of certain procedures you have described above. Please elaborate further. There they checked my old student visa and passport and asked me why I was overstaying. The IMI Officers checked on their computer records or view your already defaced old physical passport? You should NOT be producing your old passport, that would have given you a Jail term..!! The ETC issued by your Embassy is the "passport" to exit Malaysia. Is she a "student too"? Any faked stamps in her passport? What reasons she gave for the overstaying? Did officers from your Embassy accompanied her? Now I am really scared. What can I do, also is there anything I can do for my friend? Do nothing cuz there is nothing you should do but wait for the call to collect your Special Pass. Just make sure your handphone is in 100% working condition during the working hours of MY IMI. Once you have paid the compound fines means your application is successful Just calm down. Please can send me the docs that MY IMI have given you during the surrender? Please send to my email address for confidentiality and any further explanations via email replies.